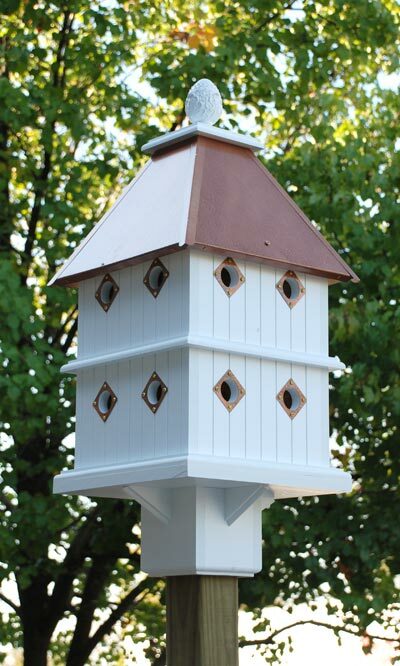 Create an elegant and impressive look in your bird garden using the Wing and A Prayer Manor House. The bold design and significant size of this home evoke a fortified medieval country home, with its square shape and large roof. Sixteen separate 1.5" diameter entrance holes lead to eight separate triangular compartments, for housing several bird families at a time. Each entrance is surrounded by a metal predator guard, matching the copper color of the metal roof. Vertical recessed lines along the sides offer the appearance of paneling, and a ledge underneath each floor offers fledglings a place to land or take off. A pineapple-inspired textured finial adds a finishing look to the item, and this can be removed easily for nest checks. For more in depth cleaning, remove the roof and lift the interior walls out of the frame. The white color of the home contrasts with the copper colored metal roof for added effect, and a textured appearance on the roof completes the look. This home is crafted from PVC trimboard, for a virtually maintenance-free item. The construction will not mildew, mold, or delaminate, and remains stable for 25 years for a lasting home. A preinstalled mounting bracket has a support on each side for added stability, and creates a simple way to add height to the home. Insert a 4" x 4" post (not included) into the mounting collar, and secure the house to the post and the post into the ground for a tall and dramatic housing unit. Bring excitement and large-scale bird elements to your yard with this Manor House. Made in the USA.